(April 13, 2018) -- The arrival of spring in San Antonio means it’s time for Fiesta. The annual party with a purpose is April 19-29 at locations across the city. Fiesta holds extra meaning this year as San Antonio celebrates its 300th birthday. The University of Texas at San Antonio (UTSA) is already in the Fiesta spirit, as it prepares to host several new and old Fiesta traditions. 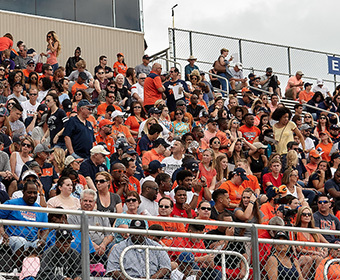 The festivities begin with the eighth annual UTSA Football Fiesta Spring Game, which is an official Pre-Fiesta event. The entire community is invited to come watch the Roadrunners at 1 p.m. on Saturday, April 14 at Dub Farris Athletic Complex located at 8400 North Loop 1604 West. The game marks the conclusion of the Roadrunners’ spring season workouts. The event will include a pregame ceremony with Fiesta Commission VIPs and the presentation of the team ball. The UTSA Athletics Fiesta medal will be on sale for $10 or free with the purchase of UTSA Football season tickets. UTSA will be well represented at Fiesta Fiesta, the official kick off to Fiesta. The party is from 4 p.m. to 9 p.m. on Thursday, April 19 at Hemisfair Park located at 434 S. Alamo St. Rowdy and Mr. and Ms. UTSA will join other members of the UTSA community in a walking parade. Admission is free. The UTSA Main Campus will be the site of Fiesta UTSA, now in its 41st year. The celebration is from 11 a.m. to 3 p.m. on Friday, April 20 at Sombrilla Plaza on the UTSA Main Campus. This year’s theme is “Las Flores de Tejas!” The celebration will feature live music, food and drinks, and plenty of cascarones! This family-friendly event is free and open to the public. New this year, the UTSA Alumni Association and San Antonio Parks Foundation team up to host the Chaparral Music Festival on Saturday, April 21 from 3 p.m. to 11 p.m. at the UTSA Park West Athletics Complex. The new official Fiesta event features an outdoor concert headlined by Texas country music stars Kyle Park, the George Navarro Band and the Chris Saucedo Band. Tickets are $25 for general admission and $20 for UTSA students. Children 12 and under get in free. Party on the Paseo is another event taking place at UTSA. The unofficial Fiesta celebration offers students and the community an alcohol-free alternative to Fiesta with music, games, food and fun from 6 p.m. to 9 p.m. on Thursday, April 26. The 10th annual celebration is bigger than ever before with a new location, the Student Union Ballrooms (HSU 1104/1.106) and features a Casino Night theme. The Fiesta Flambeau Parade celebrates its 70th anniversary this year with the theme “Three Centuries…One City.” This illuminated night parade takes place at 6:45 p.m. on Saturday, April 28, the final night of Fiesta 2018. The parade will include the UTSA float as well as the Spirit of San Antonio marching band. 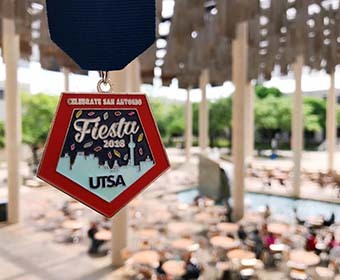 Show your Roadrunner pride day or night with the 2018 UTSA Fiesta medal. This year’s design pays tribute to San Antonio’s Tricentennial with an engraving of the city’s skyline and an added feature, it glows in the dark. It’s on sale now for $7 at Roadrunner Express on Main Campus. A portion of the proceeds will support the Roadrunner Pantry. Revelers can also purchase the official UTSA medal at the Fiesta Store located at 2611 Broadway. Various campus groups are also offering Fiesta medals. UTSA parking permit holders can enjoy Fiesta's downtown festivities with hassle-free parking. Permit holders can park at the Downtown Campus where the permit allows. When you spot Fiesta royalty at any event, be sure to wave and say hi to Miss Fiesta San Antonio, UTSA alumna Carla Juarez ’17. Continuing a UTSA Fiesta tradition, the UTSA Monument Lights will shine the Fiesta colors throughout the ten day celebration, alternating orange, blue, green, pink, purple and yellow. Learn more about Fiesta San Antonio.